Paneltech’s new 454 Conform MDO is a concrete form overlay saturated with a phenolic resin. It has high-masking properties with a mottled surface appearance that gives a pleasing leather-like finish to the concrete form. The combination of a high resin content and a resin formulated to resist the action of alkaline concrete fluids make the overlay especially useful for concrete forming applications. It gives a smooth matte finish to concrete and is treated to release easily from forms when coated with the appropriate form oil. The paper is well saturated with resin to ensure a high form life and to prevent internal paper delamination. 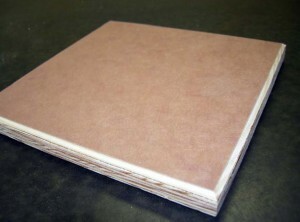 This high internal bond is unique to Paneltech’s overlays and is quite important for concrete forming applicatons. As with other Paneltech MDO products, 454C has a proprietary glueline formulation that gives it strong adhesive properties when bonding to all commonly used wood substrates. MDO 454C exceeds the requirements of the PS 1-09 Voluntary Product Standard.